Ethiopian children have been provided with tablet computers running software reminiscent of the primers from Neal Stephenson's 1995 novel The Diamond Age. 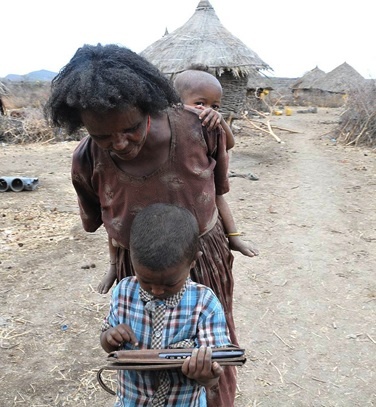 The devices involved are Motorola Xoom tablets—used together with a solar charging system, which Ethiopian technicians had taught adults in the village to use. Once a week, a technician visits the villages and swaps out memory cards so that researchers can study how the machines were actually used. The experiment is being done in two isolated rural villages with about 20 first-grade-aged children each, about 50 miles from Addis Ababa. One village is called Wonchi, on the rim of a volcanic crater at 11,000 feet; the other is called Wolonchete, in the Great Rift Valley. Children there had never previously seen printed materials, road signs, or even packaging that had words on them. The interaction design of the Nell system described above is inspired by the “Young Lady’s Illustrated Primer” in the Neal Stephenson novel The Diamond Age, from whose protagonist Nell takes its name. Nell’s design embodies four key ideas: it is a Narrative interface using Direct Interaction which Grows with, and is Personalized for, the child. Nell uses these four key concepts to build a novel learning platform which addresses several challenges we’ve encountered in earlier work. The book spoke in a lovely contralto, with an accent like the very finest Vickys. The voice was like a real person's - though not like anyone Nell had ever met. It rose and fell like slow surf on a warm beach and when Nell closed her eyes, it swept her out into an ocean of feelings. "What's a raven?" Nell said. ... it turned out to be a bird. Big letters appeared beneath. "R A V E N," the book said. "Raven. Now, say it with me." "Very good! Nell, you are a clever girl, and you have much talent with words. Can you spell raven?" ...After a few seconds, the first of the letters began to blink. Nell prodded it. "My name is--" Johanna heard a short burst of gobble with an overtone that seemed to buzz right through her head. "What is your name?" Johanna knew it was all part of the language script. There was no way the creature could understand the individual words it was saying. That "my name, your name" pair was repeated over and over again between the children in the language program. You can take a look at the apps Nell's Balloons and Nell's Colors, which require modern browsers like Chrome or Firefox to run. From Technology Review (Tablets), Technology Review (EmTech Preview) and Dr. C. Scott Ananian page. Thanks to Winchell Chung (aka @Nyrath) of Project Rho and Vik of Diamond Age Solutions (RepRap and 3D Printer Consumables ) for their contributions to this story.